Back in December, Hallmark started marketing their line of Recordable Storybooks. What made them particularly enticing was that they were similar to recordable cards. The recordable books, however, went a step further. They allow you to stop recording, if necessary, make corrections, and speak at your own pace. Perfectly modifiable! My son gave me one of the Hallmark Recordable Storybooks for the Holidays. What made this book extremely special to me is that my son has a learning disability which makes it particularly difficult for him to read. With my husband's guidance and my son's practice, I was able to hear my son read me the recordable book, "Twinkle, Twinkle Little Star," almost flawlessly! Tears were welling up in my eyes as I heard my son's sweet voice! I was overjoyed hearing him read an entire book cover to cover! This very special book will be treasured for the rest of my life. 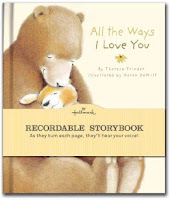 I wanted to reciprocate to my son, not only what the recordable book represented, but obtain a book that would convey the special bond my son and I share. I started looking in every Hallmark store I knew of to find one of two recordable books as a special birthday present. To my absolute dismay, I couldn't find either of the books I wanted at any of my local Hallmark stores. My heart was very heavy. My son's birthday was in August, ironically falling on the same day as the BlogHer '11 Conference. He was going to be away during the weekend of his birthday, so I took the opportunity to go to the BlogHer '11 Conference that weekend. During the Expo part of the conference, I spotted a Hallmark booth. It was the very end of the day. I approached one of the sweet Hallmark representatives and begged her for information as to how I could purchase one of the recordable books I wanted. She told me she would send me the book that I had been so desperately looking for and had me write down my address. I promised I would write a blog review about the book as a thank you for her very kind gesture. Once I returned home, I was contacted by a different Hallmark representative asking me if I would mind doing a blog review on some of their Back-to-School products. I gladly acknowledged that I would be happy to, especially knowing that the first representative was sending me the recordable book I wanted so badly. Within a week's time, I received not only the special recordable book I requested from the first rep, I also received a package from the second rep with an amazing surprise inside. As I opened the top of the box, I saw what looked like a recordable book along with several other items. I held my breath as I slid the book out of the box. To my absolute astonishment, there in front of me was the other recordable book I had been looking for! I just couldn't have been happier! I had received the very two books that I so wanted to record for my son! To make it even more exciting, I received sample cards from the new Hallmark Kids Collection that I could fill out for my son's first day of school and an adorable booklet of messages that I could tear out and put into my son's lunch tote! I recorded the "All the Ways I Love You" book before my son went away on vacation with my husband for a week. My son looked at me with mouth agape as he listened to my voice, and turned each page! He then said to me, "How did you get a book like mine?" (He was referring to the "Twinkle, Twinkle Little Star" recordable book). I told him that Mommies sometimes have magic powers! (And wonderful Hallmark representatives!). A couple weeks later, I recorded the second book. 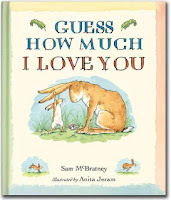 The night before my son had his first day of school, I presented him with the "Guess How Much I Love You," recordable book. Again, my son was enthralled! 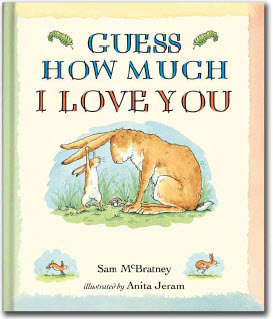 I had read the actual book to my son dozens of times. But hearing my voice as he turned each page added a completely different dimension to it. Here I was, sitting next to him, but silent, except for my voice coming from the book. Both books are displayed on my son's dresser, as his is displayed on mine. The Hallmark Recordable Storybooks are great if you are a parent who travels. Your children will be able to hear your voice, even when you are away. Additionally, these books will provide an opportunity to help develop reading skills. Most of all, they provide bonding time with your children whether you are next to them or far away. 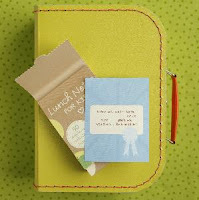 Once my son was asleep, I packed the unrefrigerated parts of his lunch and included a lunch message from the booklet, "Lunch Notes for Kids." There are 50 notes in the booklet. I chose one that said, "I'm hugging you in my heart right now. I know, I know...I'm squishing you. I'll let go in a minute." Using these adorable notes will surprise your child with a serving of love and pride. The unexpected "I love you" or "good luck" will let your child know you're by their side even after they get on the school bus. When my son came home from his first day of school, I presented him with a card from the Hallmark Kids Collection of cards. The cards address topics for both young and older children. These include messages that provide positive reinforcement, hard work achievements as well as topics for tweens/teens which focus on peer pressure and choosing friends wisely. The card that I chose to give my son said, "If I could hug you every time I think of you..." on the outside, and "you'd be smooshed!" on the inside. He gave me a big grin as I hugged him until he was "smooshed!" The Kids Collection of cards can either be snuck into a notebook or backpack as a surprise for your child to open during the day. Or, if your child might get embarrassed like mine, but loves getting mail, they can have a card waiting for them in the mailbox at the end of the day. With backpacks bulging with new notebooks, pencils and glue, kids sometimes need more than school supplies to face the exciting and challenging situations the upcoming year holds. This is why Hallmark created it's Back-to-School line. When you are helping your child get off to a good start with the new school year, don't forget to throw in a little encouragement and confidence from Hallmark! You know your child will be getting the very best from you! I would like to thank the fabulous Hallmark representatives for providing me with these wonderful Hallmark products to use and review. I am truly appreciative!